HENRIE FOOKE. Since he married in 1564, we should expect his birth to have been around 1540. The Bishops Nympton parish registers go back only to 1556. His father may be Richard Fowke, who is the only man of this surname to appear in the 1545 Lay Subsidy Rolls for Bishops Nympton. He was assessed at £2, near the bottom of the range. Alternatively, his father could be another Fooke who was too poor to appear in the tax assessment. Bishops Nympton is a large North Devon parish east of South Molton, not far from the Somerset border and the fringes of Exmoor. Around 1540, Sir Lewis Pollard of Bishops Nympton died. He was an eminent lawyer who lived at his estate of Grilstone in the late 15th and early 16th century. A highly decorated niche in the church is thought to be his tomb chest. It may also have served as an Easter Sepulchre. PETERNELL BLACKMORE. 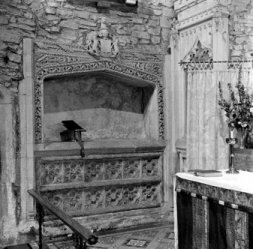 For the same reason as Henrie we have not found a baptism for Peternell in Bishops Nympton where she married. The presenters would have been among the gentry or richer yeomen. Thomas Blackemor was among those richer parishioners who had to provide arms in time of war. He was charged at G7. This means he was in possession of goods to the value of £10 – £20. He would have been required to provide a bow, a sheaf of arrows, a steel cap and a bill. A bill was a tall polearm with a hooked blade. The able men of the parish over 16 were divided into sections, each with a different weapon. John Blackmor was a billman. They were required to train with their weapons every Sunday. Thomas does not appear under any of these sections. He may have been an elderly man no longer able to fight. John may be his son. If our estimate of their birth dates is correct, Henrie and Peternell were born in reign of Henry VIII, who died in 1547. As teenagers they lived through seismic changes, as the country reverted to Catholicism under Mary I, after the Protestantism of the boy king Edward VI and Archbishop Cranmer. Henry VIII’s Reformation returned with the accession of Elizabeth I in 1558. There is a curious thing about their marriage. The baptism of their first child took place the following month. It was not unusual for the bride to be pregnant on her wedding day, but eight months is very surprising. It raises a question mark over whether Henrie really is the father, and not just drafted in at the last minute to prevent Peternell becoming a single mother. Men were sometimes paid to do this, to avoid the mother and child being a burden on the Poor Rate. On the other hand, a child born less than two months after the marriage was not considered to be the husband’s. There is also the fact that the couple had another child named John in 1578. There are other cases of parents using the same name twice, but it prompts us to look for other explanations. There may be another Henrie Fowke of whom we have found no further evidence. Or there may have been a mistake in recording the baptism. The father could have been another of the Fowkes of Bishops Nympton. Henrie and Peternell went on to have six more children. In the 1569 Muster Roll, which gives details of the Blackmores, there is no mention of the Fookes. It may be that Henrie was not an “abell man”, though he was probably only around 30. At the baptism of their last child, Henry’s wife is named for the first time. John died at the age of 3 months and was buried on the last day of December 1578. The early 16th and17th centuries were a time when the upland wastes of Devon were being taken over for farms. Farming also encroached on the commons and waste land at lower levels. Eventually only Dartmoor and Exmoor remained as open moorland. The Fookes would have seen changes on the high ground above the River Yeo. Henrie does not appear in the 1581 tax assessment for Bishops Nympton, and nor does any other Fooke. Coupled with his absence from the 1569 Muster Roll, we gain the impression that Henrie was probably infirm, unable to bear weapons and too poor to be taxed. In May 1595 we have the burial of Alice the daughter of Henrie ffooke. Alice would have been 23. Peternell died in1597. She was probably in her 50s. Henrie lived another 28 years.